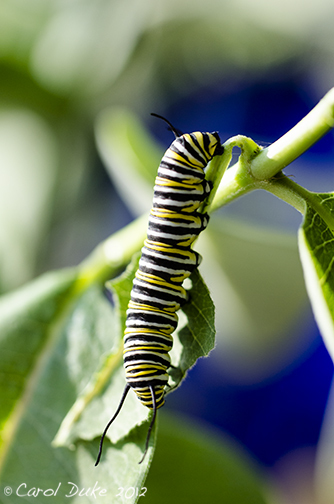 The mammouth Monarch Butterfly migration is underway. gardens and parks by lucky viewers seeing hundreds of these skilled navigators flying south. 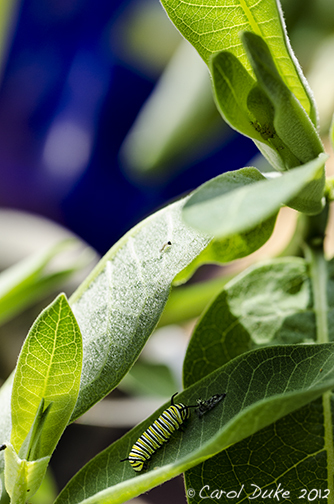 Here at Flower Hill Farm there are numerous fresh Monarchs floating about the gardens each day. 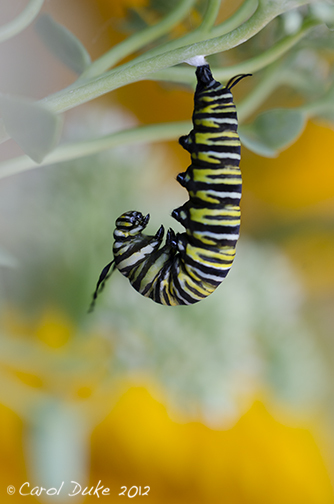 while several are scattered feeding on Ironweed, Phlox and Liatris. dotted with both Monarch and Painted Lady butterflies along with hundreds of honey bees.
. . . happily observing as each gingerly takes their impressive first flight. but even more minuscule eggs. Which came first . 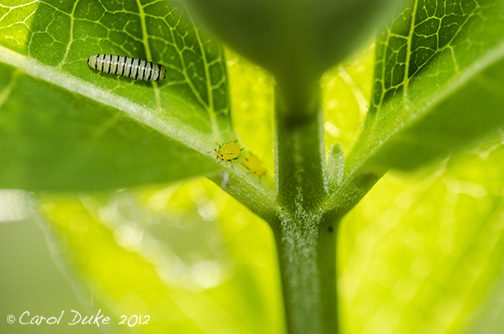 . . the butterfly or the egg? 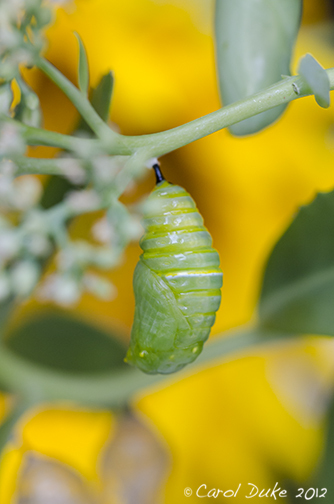 The Monarch Butterfly Metamorphosis begins with an egg and then the capable caterpillar and its miraculous feat of nurturing a chrysalis within. but how did it appear? 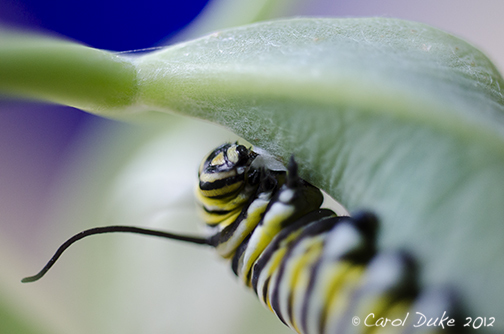 fastened it to its host Milkweed leaf . 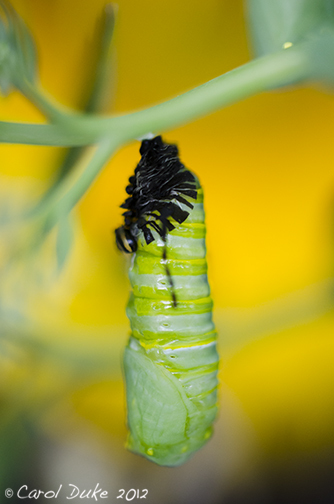 . .
with many more eggs to oviposit. 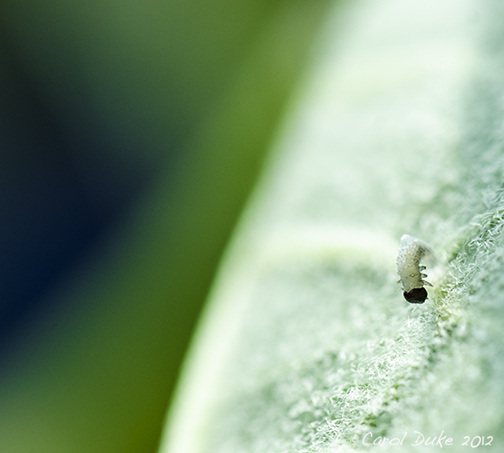 independently chewing its way out into its hairy leafy world. The egg capsule was a very tight fit. A newborns first yummy meal . . . munching its own nutritious clear egg casing. 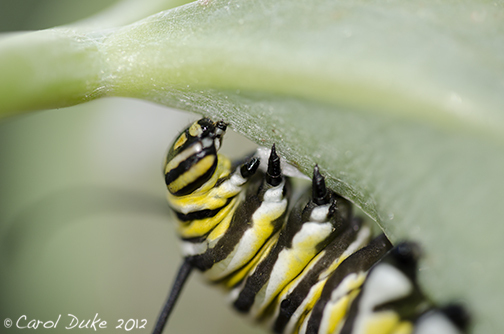 Chomping many milkweed leaves . 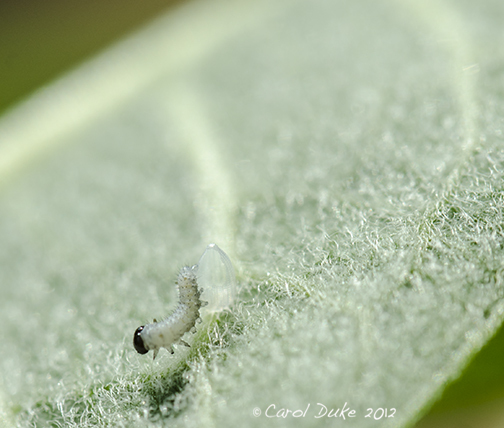 . . first instar to fourth instar. 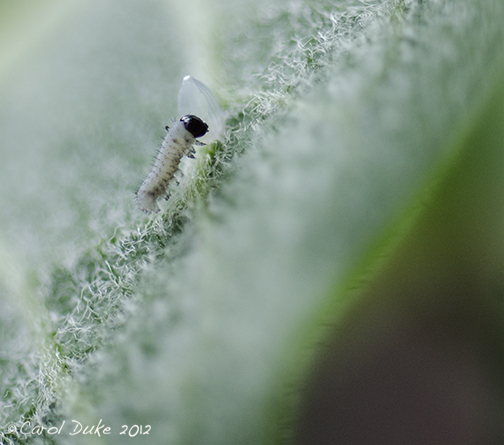 Second instar compared in size to Milkweed or Oleander aphids. 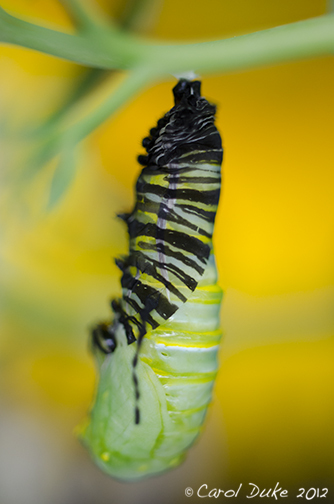 Molting along the way and turning to eat their old clear black-striped skin in each new stage. 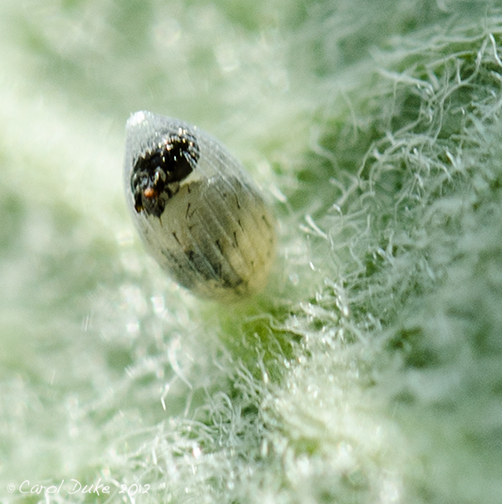 The ocelli or compound eye can be seen on the fourth instar above.
. . . not to be confused by the two longer tentacles on the thorax and abdomen. forming a protective covering for the yellow head. It is nearly time to unveil its hidden self. with the help of its singular spinneret . . .
looking closely you can see it. Expressive tentative tentacles take part in the drama of the act. 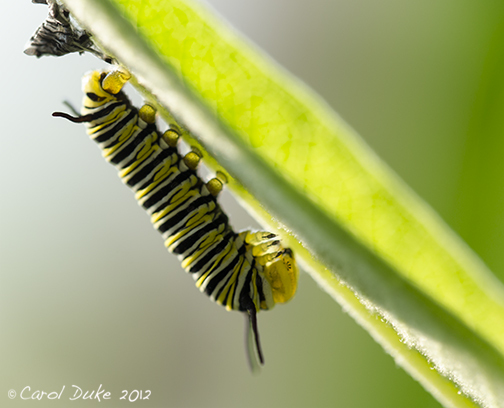 while true legs hold on to form the silk button its life will later depend on. 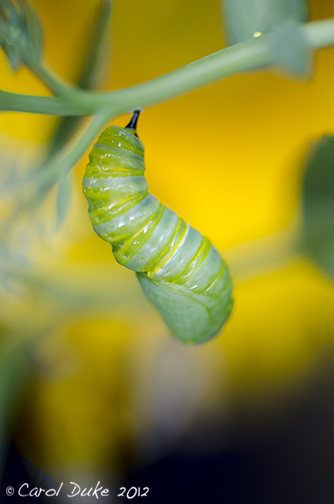 Courageous caterpillar free fall . . . holding fast to its handiwork. Stretching and splitting skin behind the head giving birth to itself. 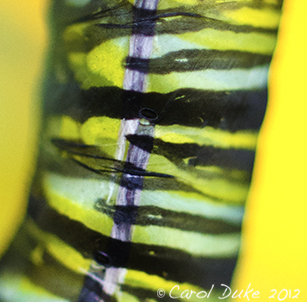 The caterpillar tracheae is a lovely lavender purple pulling up with the clear black-striped skin. 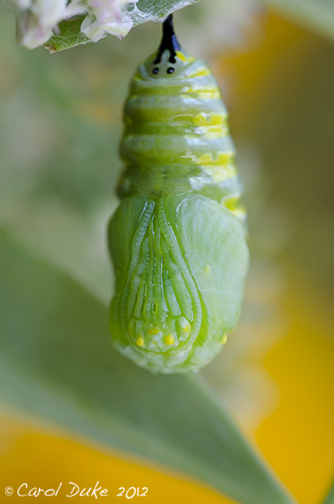 The chrysalis has its own spiracles or air holes and tracheae allowing it to breathe. I find this palette inspiring for a painting. 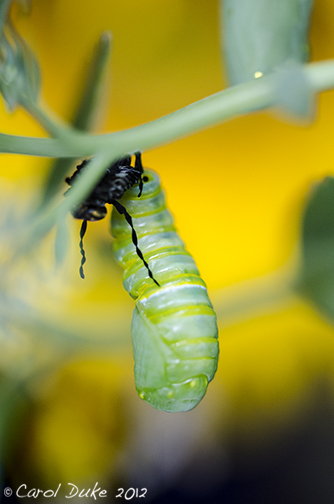 Amazing to see what was already within the caterpillar. the ebony barbed appendage hooks into the carefully formed silk knob. The old skin falls away looking like a dried up fly. being securely fastened within the silk. Now . 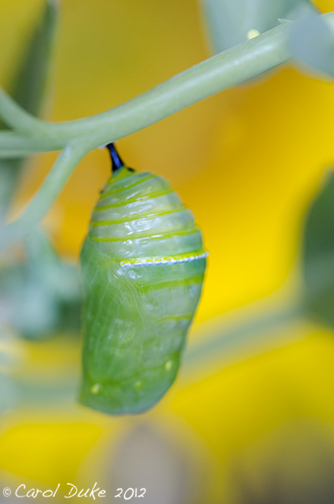 . . the shrinking act begins and all that resembles a caterpillar disappears. all to be seen then disappearing into jade green. 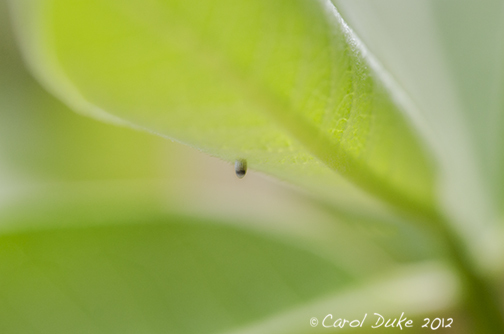 A pearl necklace appears reminding all of the pure white toxic milky juice of milkweed. of white, yellow and black. 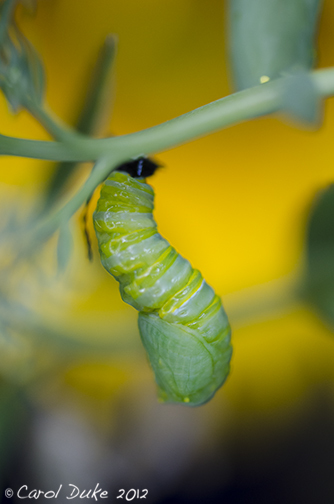 What are the colors found in the caterpillar? A token of appreciation for all the many changes it had to go through? Later the necklace appears golden . 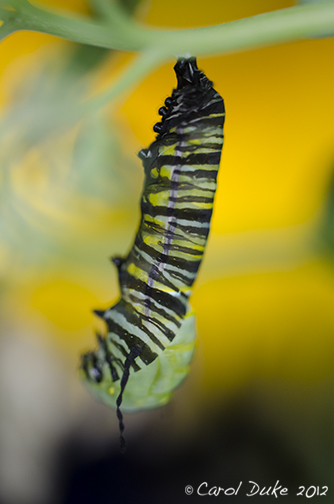 . . still the colors of the caterpillar shine. 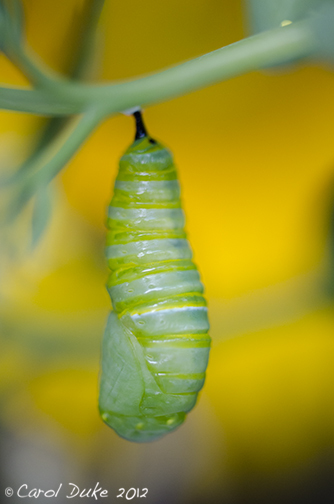 Within a few hours a clear casing will harden to protect the chrysalis. within a bouquet atop a table near the open French doors. Oh, I just noticed the one that became like a tassel on a silk pillow in a chair next to the table too. I see a fifth on a walking Iris plant near a cheery bouquet of sunflowers both on the same table. 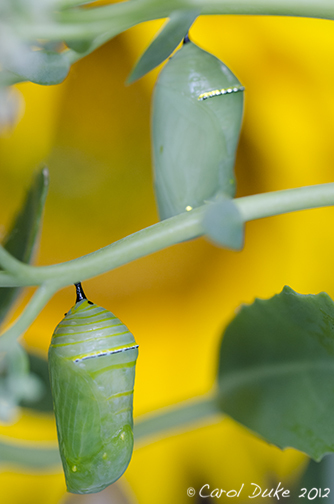 So, five monarch butterflies emerge while I write about their beginning. as all the butterflies hang like wet laundry drying their stained glass like wings. to hear chamber music at the South Mountain Concerts. Life can be enchanting here in Western Massachusetts. 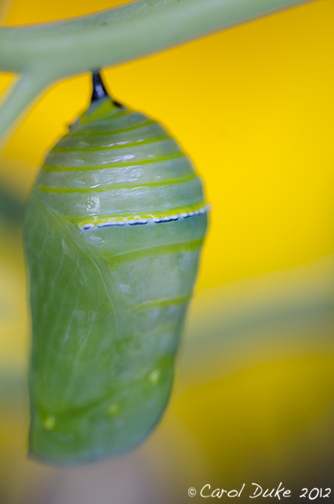 Next installment will be more on the captivating Chrysalis.